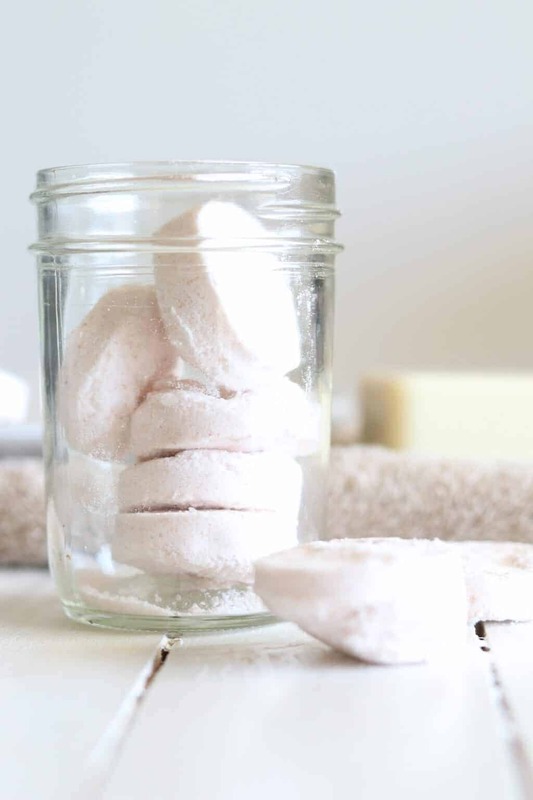 WHETHER IT HAS BEEN A LONG DAY OR YOU’RE TRYING TO GET GOING , THESE ESSENTIAL OIL SHOWER MELTS CAN DO THE TRICK. FOLLOW ALONG TO LEARN HOW TO MAKE YOUR OWN WITH A FULL VIDEO TUTORIAL. My ultra relaxing night would be a long hot bath with salts, oils, and candles. Of course, the kids would all be sound asleep and I would have a good book in hand. Ok, lets get real, that happens once a year, if that! 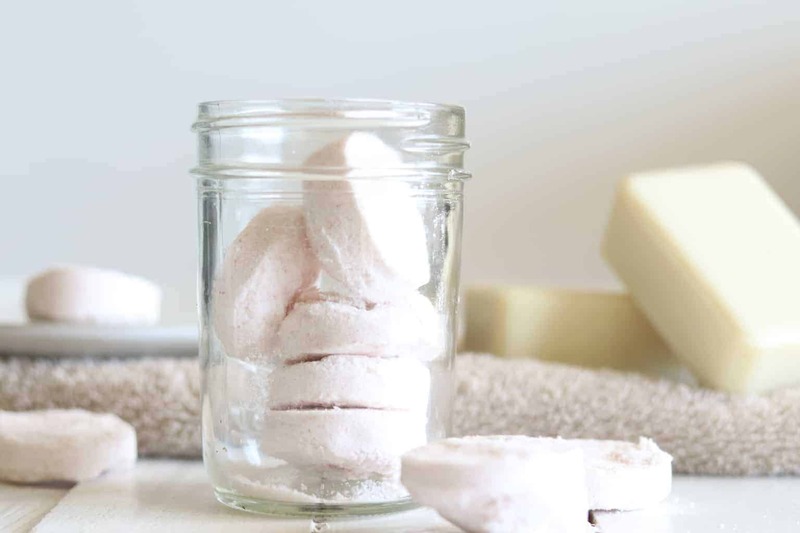 If you don’t have time for a bath these essential oil shower melts can make your shower the next best thing. Using essential oils in your shower will give you all the benefits of aromatherapy and it is something you can fit into your schedule daily. Aromatherapy is the use of aromatic plant extracts and essential oils in massage or baths. Sounds fancy, right? 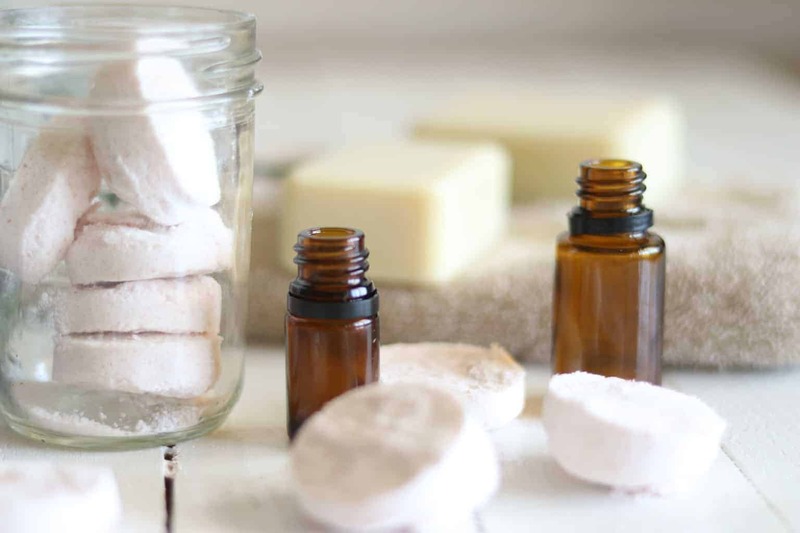 Making a batch of essential oil shower melts makes it easy to experience the benefits of aromatherapy as often as you need it. This recipe will make 15-20 shower melts, depending on the mold you use. Use within one month for the strongest scent and best results. If you don’t use them within a month (which you will, because once you start you won’t want to take a shower without them ;)) you can add 1-2 drops of essential oil on top of the shower melt before use. 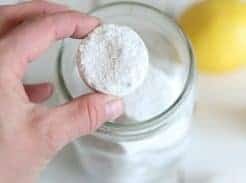 Pour baking soda and salt into glass bowl. Add water slowly, about 2 teaspoons, and stir well. You will know you have the right amount of water when you can squeeze the mixture together and it holds sightly. Be sure not to get it overly wet. Add 15-20 drops of essential oils of choice and stir well. Pour into silicon molds and press the mixture in hard to make sure there are no air bubbles and it is packed tight. Let the mixture completely dry, this takes about 48 hours. Pop the essential oil shower melt out of the mold and store in an airtight container. 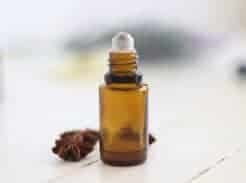 Place one essential oil melt on the floor of the shower away from the stream of water. If you place it directly under the water it will fizz way to fast. As the water hits the melt it will release the essential oils into the air and steam of the shower. Inhale and reap the benefits! I store mine in a glass mason jar on a shelf right next to my shower and pop one in every time I shower. Use this melt at night time before going to bed to help relax and calm the body, and to promote a healthy night sleep. Use this melt in the morning to uplift the mood and for a natural energy boost. Use this melt when stressed and having anxious feelings, these oils can help ground the emotions and relax the mind. A steamy shower with essential oils can promote clear and easy breathing, use this melt when congested and stuffy. Use this melt before heading off to work or school to stimulate the brain, aid memory, and promote healthy brain function. Use this melt when you aren’t feeling well to boost the immune system. 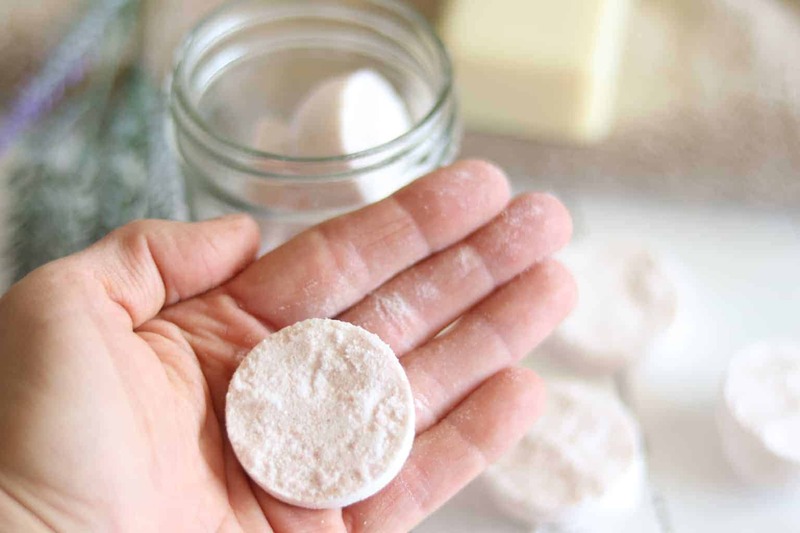 Essential oil shower melts are easy enough to make that the kids can help out. You can get creative and buy different shape molds to make them in and they can choose the scent they like. My kids really enjoy making these and using them. This shower melt is loaded with citrus oils, which naturally uplift the mood and boost the immune system. Use this melt in the morning before sending them off to school. This shower melt has all the calming essential oils, use this melt as part of the bedtime routine to promote a healthy night sleep. This shower melt has essential oils in it that can help stimulate the brain, aid memory, and help your child to focus and concentrate. I hope this post was helpful and you enjoy making these essential oil shower melts. I know we love them and I hope you do too! Have you tried essential oil shower melts before? 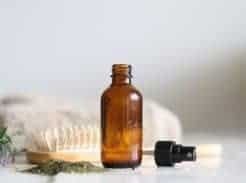 What are your favorite essential oil blends to use? You don’t mention the sea salt or epson salt in the instructions. Please advise. Sorry about that, I just updated it! You should add the salt in with the baking soda. Thanks! Hi, why do you choose to use salt/epsom over citric acid? I found that the citric acid makes it dissolve to quickly. I have a bath bomb recipe with it and it works much better for a bath bomb than the shower melts in my opinion.